Carnitine or better known as L-carnitine (L indicates that it is for human consumption) is sold as a fat burner supplement and / or physical-sport performance enhancer. But even though, its exogenous consumption (through pastes, softgels, powders, etc.) could increase their levels in the blood plasma, results in physical / sports performance and fat burning do not change significantly, or at least not those that have to do with physical / sport performance. 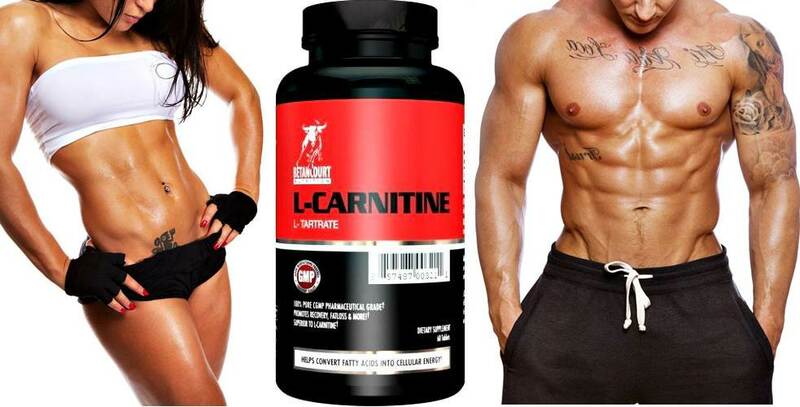 L-carnitine can be found even as a component of Proteins (protein powders) that are usually marketed as "a supplement for the definition phase" ... companies make people to believe that they are specific components, ideal and very efficient in allowing the muscular "definition" by means of the "magic" reduction of the levels of body fat. At the same time, carnitine is also promoted as a supplement that strengthens training, which would be rooted in the alleged increase in fat burning during and after the training session that may involve exercises with and without weights, performed at medium and / or high intensity ... And, according to a study I will mention below, the reduction of fat burning thanks to the consumption of carnitine or L-carnitine seems to be possible. What exactly is Carnitine and what is its function in the body? Keep in mind that carnitine is a non-essential compound (it is an amine), meaning that our body can synthesize it through essential amino acids such as lysine and methionine through organs such as liver, kidneys and brain. .. that is to say that until now you will be able to realize when consuming the mentioned essential amino acids that our organism can not synthesize, you can also increase the carnitine levels in your skeletal musculature. Carnitine has the main function of intervening in the transport of fatty acids (which we obtain through the degradation of triglycerides) to the interior of mitochondria, which are organelles where processes of production of energy by oxidative means occur, or through the use of oxygen as a means of "combustion" of energy substrates such as the aforementioned fatty acids, glucose, lactic acid and some amino acids such as glutamine, valine, isoleucine, adenine and leucine. ... or well, actually according to a study I will mention below, carnitine in skeletal muscle tissue did increase its levels through the intake of L-carnitine capsules, and thanks to this the fat burning increased in comparison to a group that did not consume carnitine during the study, both groups being subjected to several weeks of HIT training sessions ... In the other study, it is said that physical / sports performance did not improve. However, in the study in which carnitine levels were increased by the daily intake of 1.36 grams of L-carnitine in combination with a drink containing 80 grams of carbohydrates, the burning fat observed was mainly thanks to the exercises of moderate intensity and long duration, that is to say where there was a stable state or also known as Steady-rate: where the consumption of oxygen was enough to oxidize fats and to reuse lactate. Title of the study: "Skeletal muscle carnitine loading increases energy expenditure, modulates fuel metabolism gene networks and prevents body fat accumulation in humans". Population and methods: 12 subjects considered as amateur athletes were evaluated. They were separated in a control group (CON) with an average decimal age of 28.5 years to which they were supplemented with beverages containing carbohydrates only, and the group of Carnitine (CAR) with an average decimal age of 25.3 years which was supplemented with a drink containing 1.6 grams of carnitine and 80 grams of carbohydrates. Why to consume carnitine with carbohydrates? Because this way stimulates the production of insulin which is a hormone that also allows the "journey" and passage of the carnitine through the bloodstream where it should arrive. All subjects in both groups (CON and CAR) were first subjected to stress tests on a cycle ergometer to determine their VO2max level. Then, for 12 weeks, the subjects performed a daily training time of 30 minutes in a cycle ergometer at 50% of their VO2max. Both groups were asked to consume their respective drink twice a day, one intake in the morning and the other 4 hours later in order to maximize the time when the plasma carnitine concentration rises in the presence of circulating insulin which also increase. Results: It was assumed that the levels of carnitine in the skeletal muscles were equal in both groups before starting the 12 weeks of training. After the 12 weeks of training, the CAR group increased their levels of Carnitine at muscle level by 21% compared to the CON group, which as we remembered only consumed the carbohydrate drink without carnitine. In the CAR group the final level of carnitine was 4.5 mMol per kg of lean mass compared to the CON group with only 1.5 mMol of carnitine per kg of lean mass. Regarding total body mass, in the control group (CON) there was an increase considering that before the study they had an average weight of 75.1 ± 4.2 kg, and after the 12 weeks of study they ended up with an average weight of 77.0 ± 4.1 kg, where through DEXA test it was determined that of those 1.9 kg of more, 1.8 were of body fat, and of those 1.8 kg ... 1.0 kg were of fat in the trunk. Regarding the level of muscle mass or lean mass (fat-free muscle mass), there were no significant changes in either the CON or the CAR group compared to data obtained before the 12 weeks of training. At baseline, the mean of the control group was 60.3 kg and ended at 60.1 kg, while in the CAR group at baseline the average was 60.5 kg and at the end of the study it ended at 60.9 Kg on average . - Remember that these subjects trained 50% of their VO2max, which is a threshold where our body through the use of the oxidative energy system, can cover 100% of the energy requirement. It could be said that the consumption of carnitine could have helped this factor (oxidizing more fatty acids) taking into account that the diets of both groups were controlled by the evaluators. - From the above and according to the other study I will mention below, it follows that the consumption of L-carnitine would not help the fat burning during training of greater intensity (either HIT or HIIT with or without weights), since The percentage of work based on oxygen consumption would increase and therefore the body will require the use of anaerobic energetic substrates (which do not need oxygen to burn). - Another important fact to keep in mind is that people with a low level of training may not benefit greatly from the use of L-carnitine since the ability to collect / consume and use oxygen to burn reserve fat will not be equal to one person with more level of training and therefore with greater capacity of oxygen consumption. - Another important point to consider is the age of the participants, since the group that ingested carnitine is almost 3 years younger on average than the control group who did not ingest carnitine. So roughly we could speculate that a younger population usually has a higher metabolic rate and thus generate a greater "burning" of fat. - Keep in mind that it is crucial to exercise to optimize or magnify fat burning by consuming L-carnitine. If you consume it but do not exercise, there will be no results speaking of reducing body fat levels. Title of study: "Increasing skeletal muscle carnitine availability does not alter the adaptations to high-intensity interval training." The main point of this study is to see if the daily intake of carnitine influences the physiological adaptations of the evaluated subjects, or in other words: to determine if carnitine improves physical performance. Population and study methods: 21 men with an average age of 23 years were evaluated. All of them underwent a 2-minute 3-minute workout on a static bike with a maximum power of 100 watts, with breaks between 5-minute sets. From the 21 subjects, 14 belonged to the CAR group who consumed a beverage with carnitine and carbohydrates during the study, and the rest belonged to the control group (CON), which did not ingest carnitine during the 24 weeks of the study, and only ingested one drink with carbohydrates. At the end of the study, blood samples were taken to determine the amount of carnitine in the muscles of the subjects in each group: the CAR group had 30% more carnitine in muscle compared to the CON group. To determine if this high concentration of carnitine influenced the performance, samples were taken to determine the amount of lactate, degraded phosphocreatine, glycogen degradation, among other factors. The results showed that the amounts of all these compounds were similar between the two groups. In summary: the greater dependence of non-mitochondrial ATP resynthesis during a second intense exercise session is accompanied by a greater acetylation of carnitine. The increase in muscle carnitine during 24 weeks of HIIT did not alter this, neither improved muscular metabolic adaptations nor produced improvements in performance beyond the results obtained by those subjects who performed HIIT training without the consumption of carnitine. - Compared with the previous study, the intensity of the workout session was higher, so we can assume that the increase in the consumption of carnitine does not influence the fat burning and therefore neither in the physical-sport performance. - We could say that carnitine could stimulate some fat "burn" in those who present it in greater amounts in their skeletal muscles, only if the intensity of exercise is equal or less than 50% of each person's VO2max, and always in the case of non-sedentary persons nor people with a relatively low level of physical condition. Study 1: Francis B. Stephens et. To (2013). Skeletal muscle carnitine loading increases energy expenditure, modulates fuel metabolism gene networks and prevents body fat accumulation in humans. Http://onlinelibrary.wiley.com/doi/10.1113/jphysiol.2013.255364/full. Study 2: Christopher E. Shannon et. To (2017). Increasing skeletal muscle carnitine availability does not alter the adaptations to high-intensity interval training. Http://onlinelibrary.wiley.com/doi/10.1111/sms.12885/full.